Domestic x exotic wild-cat hybrids are sometimes used to explain Alien Big Cat (ABC) sightings in the UK. Though hybridization could explain some striking looking domestic cats, cats are variable creatures; colour or size variations cannot be construed as evidence of hybridity and can be accounted for in terms of gene mutation and recombination. The probable ancestor of domestic cats is the African Wildcat (F. lybica/F. silvestris lybica) which, through mutation and selection, has given rise to the diverse forms which constitute modern F. catus. Professor Eric Harley considers F. catus to be a natural sub-species of F. lybica. The intractable European Wildcat (F. silvestris) can interbreed with F. lybica and may also have contributed genetic material. The more amenable Jungle Cat (F. chaus) is another suggested ancestor and in 1991, Tabor argued that its influence on domestic cat evolution is under-estimated. Characteristics found in the Abyssinian breed (ticked colouration, ear-tufts) support this view. 18th Century sailors acquired Jungle Cats from villages in India. The cats, kept as ratters or trade goods, may have jumped ship at various ports, breeding with available domestic cats hence early British sightings tend to be centred around ports. Lately, Jungle Cats (or variable moggies?) are sighted around cities, attracted there by edible refuse and available mates. While initial (F1) hybrids between domestic cats and the larger Jungle Cat are both large and fertile, subsequent generations would become smaller through continued interbreeding with the more numerous domestic cat until they become indistinguishable from moggies. Though vigourous, hybrid animals do not breed true and in succeeding generations there is a selective return to the original genetic combination prevalent in the area. Only repeated back-crossing with Jungle Cats would maintain Jungle Cat attributes in hybrid offspring. Chromosomal and DNA analysis cannot currently distinguish between the two and if Tabor's theory is correct, F. chaus is simply breeding with its own much-hybridized distant descendants. If the Jungle Cat has been present in the UK for 200 years, its genes may already be present in the domestic population, compounding problems of DNA analysis. Domestic cats and Scottish Wildcats readily interbreed. Wildcats are generally untameable and hybrids inherit the Wildcat temperament, though later generations (F1 x F1) exhibit throwbacks to both Wildcat and domestic grandparents. Between 1873 and 1904, the Scottish Wildcat was experimentally crossed with various domestic breeds. In 1939, Frances Pitt reported that Wildcat hybrids are "nervous and queer-tempered", tending to revert to wild type. 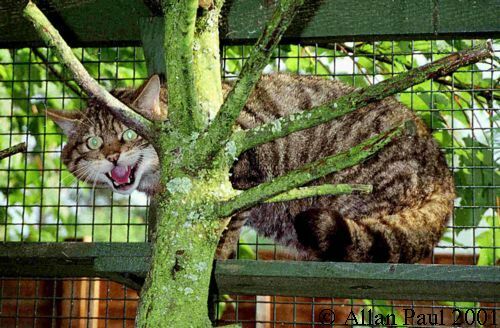 Studies indicate that continued interbreeding of Scottish Wildcats with domestics causes Wildcat type to degenerate. In 1941 Harrison Matthews stated that hybrids tend to be smaller and as far back as 1896, naturalist Edward Hamilton suggested that the true Wildcat was being supplanted by hybrid "mongrel" Wildcats. In areas where they regularly interbreed, descendents become closer in type to domestic cats with modern Wildcats exhibiting progressively more domestic cat traits including including smaller size, tapered tail with fused black banding and white markings. Presumably, in areas where the Wildcat predominates, it is the domestic influence which will be diluted. The "Kellas Cat" may be a complex domestic x F. silvestris hybrid with Wildcat blood predominating. Incidentally, photographs of the "Tonmawr Cub", a supposed ABC cub seen in Wales show it to be an adult Scottish Wildcat, while sightings of Wildcats in Surrey may result from an escaped hand-reared Wildcat and his progeny. Cryptozoologist Karl Shuker suggests that escaped Leopard Cats (F. bengalensis) may have resulted in hybrid offspring in Britain, citing the development of the Bengal breed to support this. While the Bengal originates from such hybrids, those hybrids most often do not breed successfully without human intervention. In the definitive book of the breed, "Getting to Know the Bengal Cat" by Gene Johnson, it is documented that F1 males are sterile while the fertile F1 females commit infanticide. F2 (hybrid x domestic) kittens must be raised by a foster-mother if they are to survive and breed (which they do normally). Without human intervention, hybridization would stop with the sterile F1 males and infanticidal F1 females. A more likely, albeit dilute, source of Leopard cat genes is the Bengal cat itself. Bengal x moggy offspring will not be ferocious giants as, contrary to wildly inaccurate press reports, Bengals are affectionate, unaggressive and normal pet cats. New "designer breeds", all perfectly tame, have been developed by hybridization with the Bobcat (F. rufus) although the evidence for hybridization is often apocryphal. These are the "American Lynx", "American Bobtail" and the polydactylous "Pixie-Bob", none of which are currently found in the UK. Apart from the Jungle Cat, which readily mates with domestic cats, there is a greater likelihood of non-native genes entering the moggy population from designer-breeds than from escaped exotics. Other small cat species, which may occur as escapees, will hybridize with F. catus. F. tigrina, the Tiger Cat (Little Spotted Cat) can interbreed although most offspring are stillborn and meetings between Tiger Cats and domestic cats normally result in the death of the domestic due to the Tiger Cat's highly aggressive nature. Geoffroy's Cat (F. geoffroyii) females will mate with domestic tomcats though male Geoffroy's cats kill domestic females. Hybrid offspring, dubbed "Safari Cats", are reportedly tame and fertile. The Black-footed cat (F. nigripes) will breed with both domestic cats and F. lybica, fertility of offspring is not recorded. The Bobcat (F. rufus) will hybridise with domestic cats and several new breeds are being developed from such hybrids. Both Pallas's Cat (F. manul) and Sand Cat (F. margarita) may have contributed to the domestic cat gene pool as ancestors of longhaired cats, though this is refuted by modern zoologists. The German naturalist Peter Pallas who discovered Pallas's Cat in the 18th century recorded that it would breed with domestic cats. Likewise, the Asian Golden Cat (F. temmincki) may have had some input into Oriental breeds e.g. the Siamese. Shuker suggests that there is a "... realistic chance that interbreeding between escapee jungle cats, leopard cats and feral domestic cats has begun in Britain's countryside" but fails to take into account the problems encountered by Bengal breeders. His suggestion of a "self-perpetuating strain of notably large hybrids" is unrealistic, since continued interbreeding will restore the smaller sized "norm". Likewise the suggestion that non-native genes will lead to an "unpredictable addition to the British ecosystem" is faulty since the wild influence is diluted by interbreeding with the native population. Domestic cats will simply assimilate the non-native genes, from whatever source, as they have done throughout their long evolution. Only where the non-native species predominates or in isolated colonies where an exotic male breeds with his hybrid daughters and grand-daughters will there be any real shift from moggy to wild species type. In a parallel in the deer world, Waipiti were introduced into Red Deer herds to improve Red Deer type. However, the Red Deer type degenerated instead. Hybrids must be selectively bred using the best specimens from each generation and backcrossing to those from preceding generations to fix traits in the population. Left alone, nature breeds out the influence of introduced individuals (who are usually in a minority) until the norm is restored. Though fascinating to hypothesise what would happen if all these errant exotic genes met up in the cat population at large, studies suggest that we need not worry about races of oversized hybrids. As a cat rescue worker I find the prospect of domestic-cat-sized, "queer-tempered", rosette-patterned, stumpy-tailed, tufted-eared felids no worse than the bad-tempered ferals I already encounter. F. catus already contains such a hotch-potch of genes that it would absorb any infusion of new blood from escaped exotics without tripling its size or endangering livestock.